Several hundred Haverford Students were treated to a picnic on Founders Hall Green earlier this year as part of an effort by the bi-college Career Development Office to reach out and familiarize the students with their services in career counseling and job searches. For their efforts, the staff received the 2003“Award for Innovation” from The Eastern Association of Colleges and Employers, of which the two schools are members. 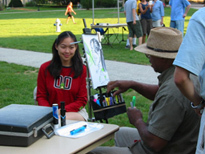 With the help of Haverford's dining center, the conference office and the coordinator of student activities, the Haverford/Bryn Mawr Career Development office arranged for music throughout the picnic by a Haverford radio station deejay, raffled prizes from local businesses and restaurants, and offered students free photographs and caricatures of themselves. Close to 85% of the student body attended.